← A Shaker Beats A Skunk! 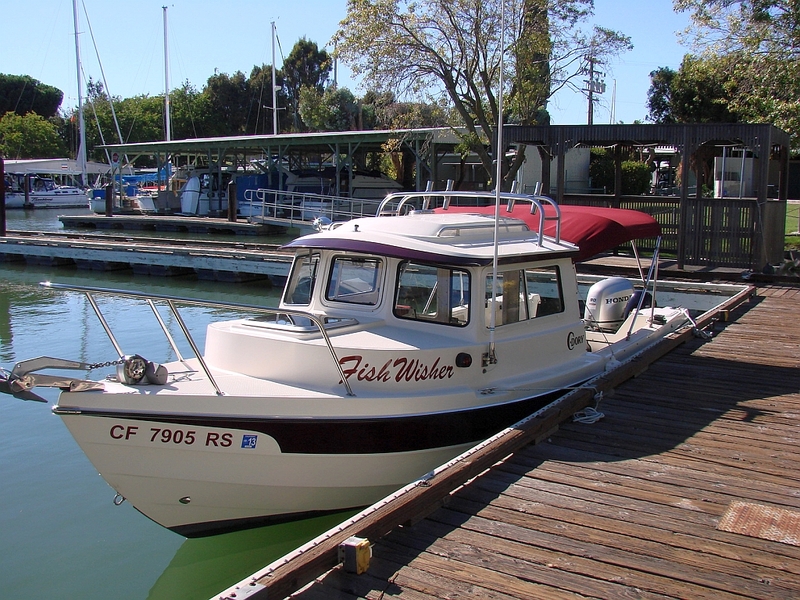 It had been six months since I launched my beloved FishWisher while she sat lonely and forlorn in her shed. It seems that I have lost interest in trolling the lakes during the summer, and I gave up fishing the cold winter months years ago. It was a year ago, back in September of the 2012 salmon season, when I last caught a fish worth keeping. Honestly, all the prep work to go fishing and the work putting everything away afterwards seems to have made fishing a lot of work in my old age. It’s my fault that it takes so much work; I always go for a least an overnight trip and have to take a lot of “stuff”. FishWisher at the dock on Day 1, awaiting her call to duty. Whatever the reason I’ve been so inactive, a Delta salmon adventure with my old high school buddy, Al, might re-ignite my love of fishing. We’ve had some great trips in the past, and a couple of them are posted below. To read about them, click the links at the bottom of this page. I spent Friday morning washing and prepping the coach. I spent Saturday morning washing and prepping the boat. 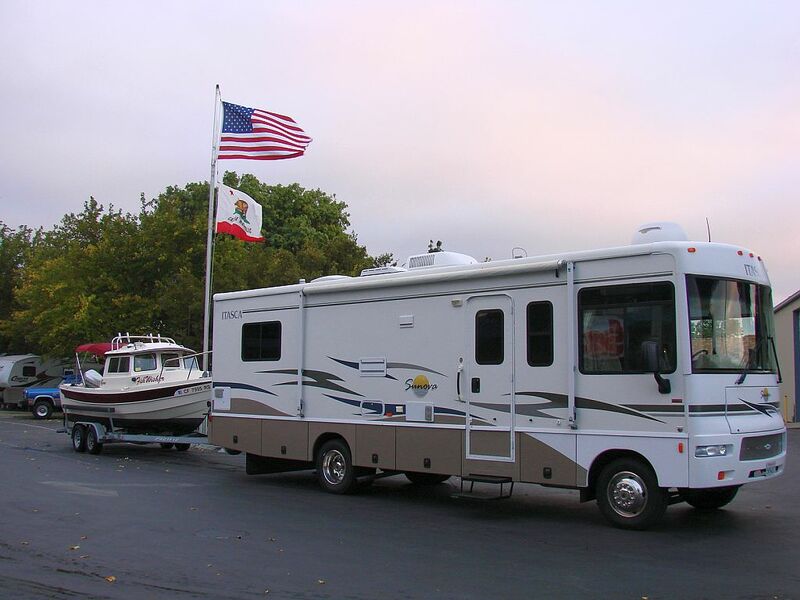 Sunday morning I loaded everything for the four day trip onto the coach and boat, and headed for Delta Marina in Rio Vista. I was pooped after all the loading, but I did get an hour’s respite while driving to Rio Vista. When I arrived, I launched the boat at Delta Marina’s ramp and motored it over to the dock and secured it for the night. I unhooked the boat trailer and had to hand push it into its parking spot. Then I parked the coach in the RV space and set it up for the three night stay. Whew. The day’s work underscored just how tiring all this fun can be for an old man! 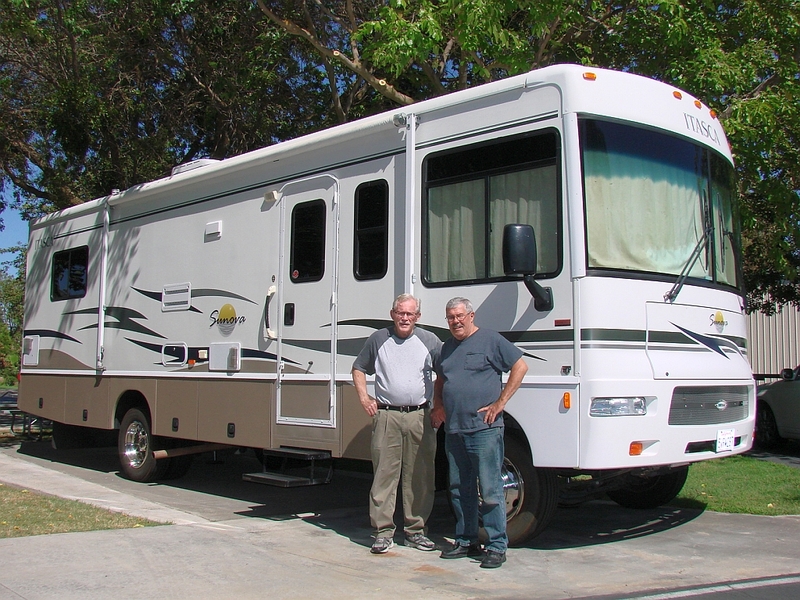 Al and I at the coach in Delta Marina’s lovely and convenient RV park. I flopped onto the coach’s comfy bed for a nap about 1515. The next thing I knew the phone was ringing. It was 1600 and Al had arrived after his long drive from Oregon. He called me to be sure which coach in the RV lot was mine. I welcomed him with a big hug, and helped carry his stuff into the coach. We sat around catching up on things ‘til about 1730, then headed to town for dinner at Mickey D’s. Back at the coach after dinner, Al pulled a book from his bags, and settled back on the couch. Between paragraphs he watched baseball on TV. I was at the computer recording this travelogue and editing photos. Around 2200 I headed for bed and not much later Al made up the couch bed. It had been a long day for both of us. I was up and around about 0600, and Al was up a bit earlier. We did the morning stuff, getting things sorted for the day and deciding what to do for breakfast. We quickly agreed to head to The Striper Café in Rio Vista. It’s a well run, clean, small town café with good food. After breakfast we returned to the marina, loaded up the boat and headed off for a day of trolling for salmon. We began the troll just below the Rio Vista Bridge at about 0830. We trolled several miles above the Isleton Bridge, then back downriver almost to Isleton. We trolled almost seven hours for nada, zilch, zero. We saw many boats, but never saw anyone catch a fish or even lift a net. We saw one boat with a salmon on a stringer, but that was it. We thought we had earned a fish for all the effort, but it was not to be. It was a nice boat ride, I suppose, and the weather cooperated nicely. Al releases some of our limits of river grass and “hair” that we caught both days. We were back at the dock a bit after 1600, toted the stuff back up to the coach, and enjoyed the air conditioned coolness after a warm day on the river. I climbed into the phone booth shower in the coach and Al headed to the marina’s showers. We then headed into Isleton for a truly lousy Chinese dinner. It wasn’t the best day fishing, but two old fishing buddies got to spend several hours together doing what we like best. We sat around the coach that evening, Al with his Louis Lamour book and Monday Night Football on TV, and me at the keyboard, as usual. We turned in around 2200. The day dawned windy and cool. We drove to the Striper Café for breakfast again, wearing sweat shirts to be comfortable, and wondering what was happening to our warm weather. 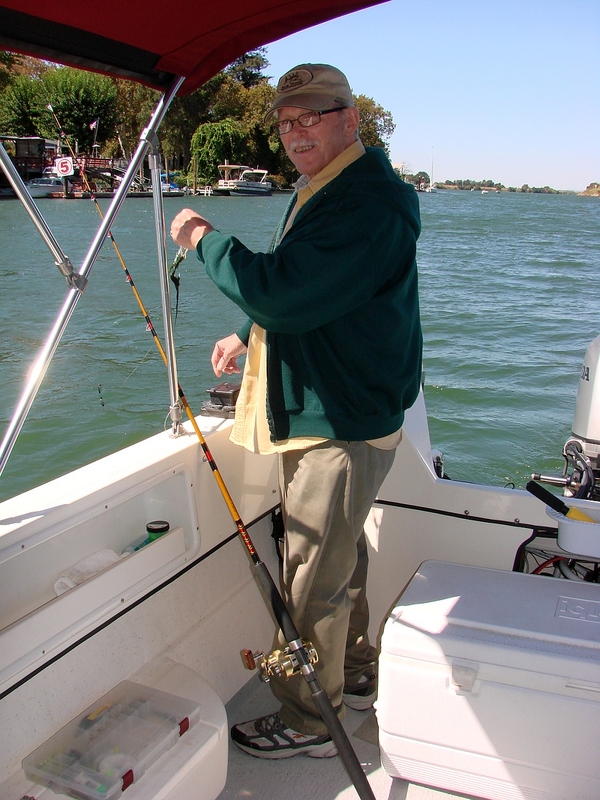 We began fishing around 0900, and were almost at Vieira’s on the Old Sac at that time. The main river and mouth were entirely too windy for pleasant trolling although a handful of diehards or fools were fighting the wind at the mouth, hoping for a salmon. 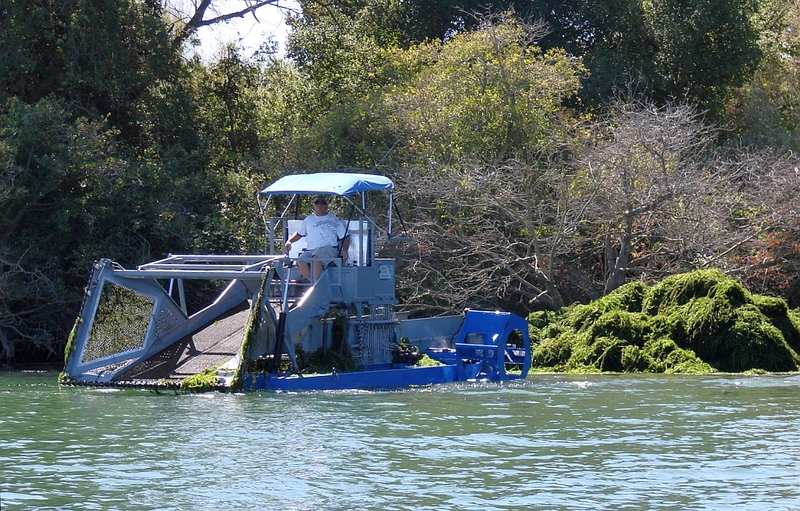 This incredible contraption, with paddle wheels, was busy collecting grass from a local marina. I suspect he contracts to most areas that need to have grass removed. Note the pile of grass he had removed and stacked near the river bank. It seemed to us that it would all float away at the next high tide. We trolled upriver only as trolling downriver, against the wind, wasn’t worth the effort. Again, we didn’t see anyone catching, and fewer boats out trying that windy day. We stayed at it ‘til a bit after 1300 and then gave up early. We were not having a good time, really. We weren’t catching anything, and we didn’t see anyone else catching. We decided to head to the dock early. Al was tired of the endless trolling for nothing, and I couldn’t blame him. While I might have given it another couple hours, I was willing to call it quits for the day. Back at the coach Al read his book and I did computer stuff. We took naps. We just passed the time ‘til about 1800 when we finally headed to Foster’s Big Horn for dinner. Foster’s Restaurant’s walls are covered with trophy heads of perhaps more than a hundred mammals that the original owner shot back in the 30s and 40s. He had been a bootlegger in the Bay Area and was on the run, more or less, when he came to Rio Vista. After his hunting days he established the restaurant and ran it ‘til his death in 1963. It’s had several owners since, and has run continuously all these years. It’s nothing fancy, but it is interesting. The mounted heads include a full size bull elephant that dominates the entire dining area. Again, as in past visits, with all those long-dead, sorrowful eyes looking down on us, we just couldn’t order meat for dinner. We enjoyed some pretty good fish and chips, however, and ordered delicious apple pie ala mode for dessert. We were back in the coach after dinner, where Al read and I clacked the keyboard and surfed the web. We hit the sack around 2200. Al was up and readying for his trip home around 0400. He decided to head home early instead of spending the morning trolling for fish that didn’t seem to be there. Again, I can’t blame him. I helped him load up the car and he pulled out of the marina lot at 0515. He would drive through to Keizer, Oregon (near Salem) and home where his sweetie awaited him. I believe he’s still on his honeymoon; they’ve been married a year and a half and are as happy together as two bugs in a rug. I returned to the coach and began converting our comfy fishing cabin into a highway cruiser. By pushing a couple of buttons the slide moved in and the jacks came up. I unplugged the electric cord, the water hose, and the TV cable and stored them in the lower holds. It was still dark as I wrestled the boat trailer out of its parking spot, then drove the coach over to it and hooked ‘em up. Daylight was just breaking across the river as I backed down the ramp. I walked down the dock and climbed aboard the boat. I motored over to the ramp, and struggled to get it loaded onto the trailer. The balancing act required to climb onto the back of the coach, then onto the trailer tongue, then stretching out to secure the tie down is not meant for old people. But I managed. I replaced those toys with a little Genesis sports car and many months later I still am convinced that I made the right decision. At 70 years old, the work involved in fishing and maintaining the boat, etc, was just too much. Sure, I miss the pleasant hours spent sitting in the cockpit of a really nice boat, awaiting the bite of a big ol’ sturgeon. But I certainly do not miss the work involved with the boat, etc. Also, the endless additions of rules by an out of control Fish and Game Commission took a lot of the pleasure from the sport. I do NOT miss the commission nor the DFG and their nonsense. Life goes on and we have to change. I now have just the motorhome and I greatly enjoy driving it around the country! This entry was posted in Fishin' with ol' buddy Al, Fishing Humble Files, Fishing Salmon. Bookmark the permalink. Sorry to hear you didn’t catch any fish but I, and I’m sure everyone else as well, enjoy reading about your trips nonetheless. You look like a true fisherman and I’ll bet you’ll get over this “phase” of old age getting in the way of your love to fish. Looking forward to reading more of your trips. We don’t share the same windlass any longer as I sold my boat a few months ago as told about elsewhere on this site. I had a similar windlass on a Bayliner with the plastic gypsy (what I think you refer to as a fleming?) and it wore, too. I replaced it with metal. I’ve always run all chain rodes and they’re likely harder than combos with nylon rode.